Have you seen the neat new piping tips all over the interwebs lately?? 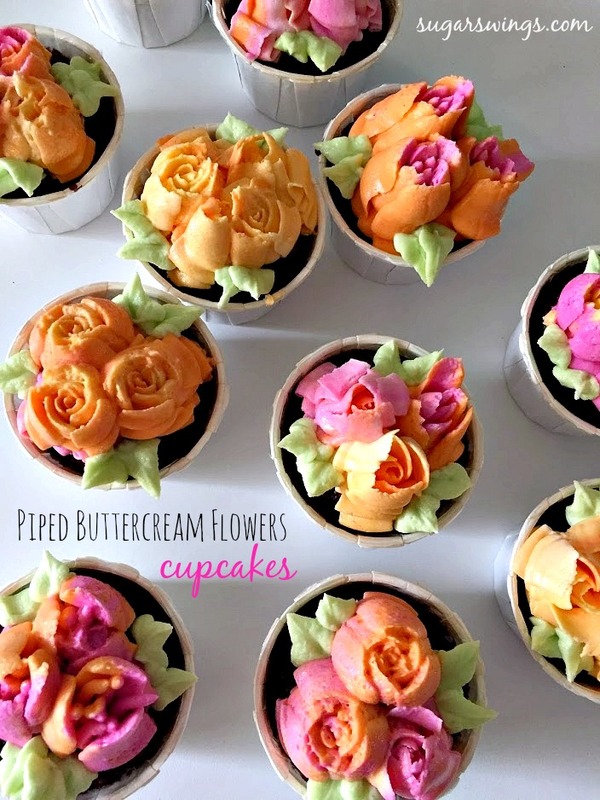 If you search "Russian piping tips" you can find all kinds of examples of them and the pretty flowers they let you make. Needless to say I had to get some. 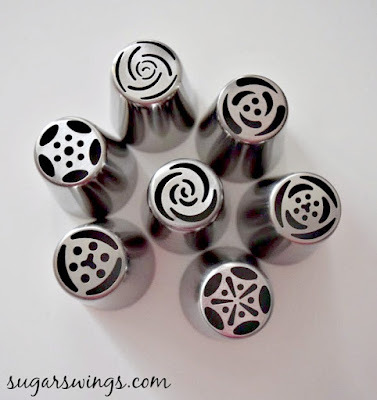 Look at these neat and detailed designs built into the tips! To pipe the flowers, start by adding some frosting to plastic wrap. Use any color(s) you like. 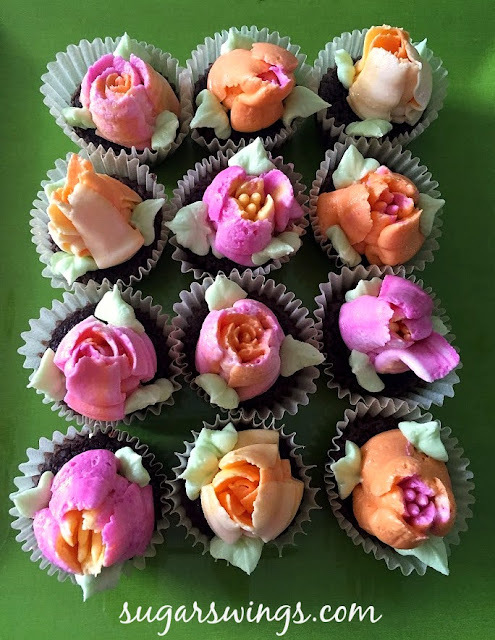 If you want a different color in the center of the flower, use another color in the middle of the frosting. 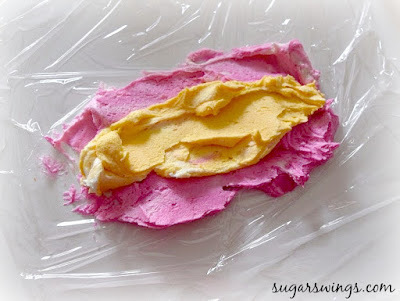 Wrap the plastic wrap up so you have a long "log" of buttercream. Mix and match colors. That will give you some really pretty colors in your flowers. Add your tip to a piping bag - they are pretty large. 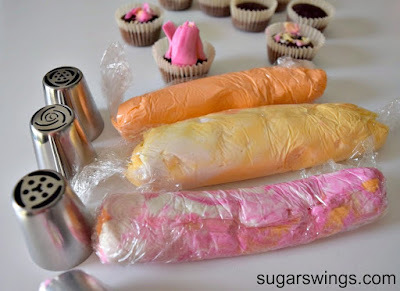 Cut off the end of the plastic wrap and icing log then insert that end into the icing tip. Push the icing down until you see the icing coming out of the tip. 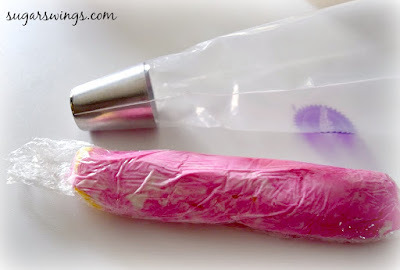 Pipe the flower by adding some pressure and pulling up to form the flower. After a little practice this gets much easier. For a final touch add some buttercream green leaves. 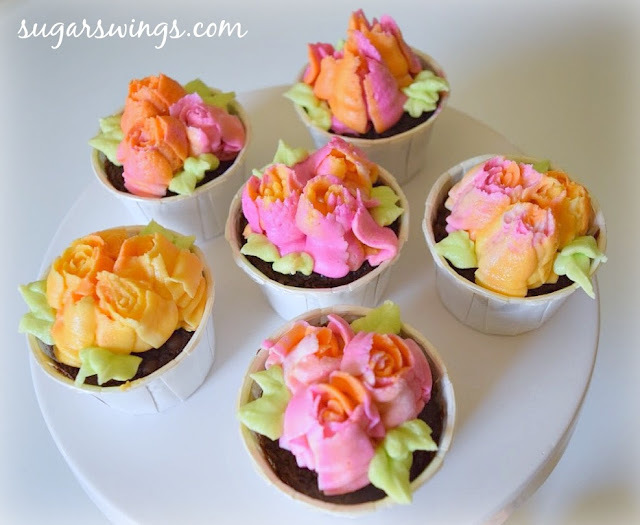 And you get some perfect little flower cupcakes. I can't stop making these little fun flowers. 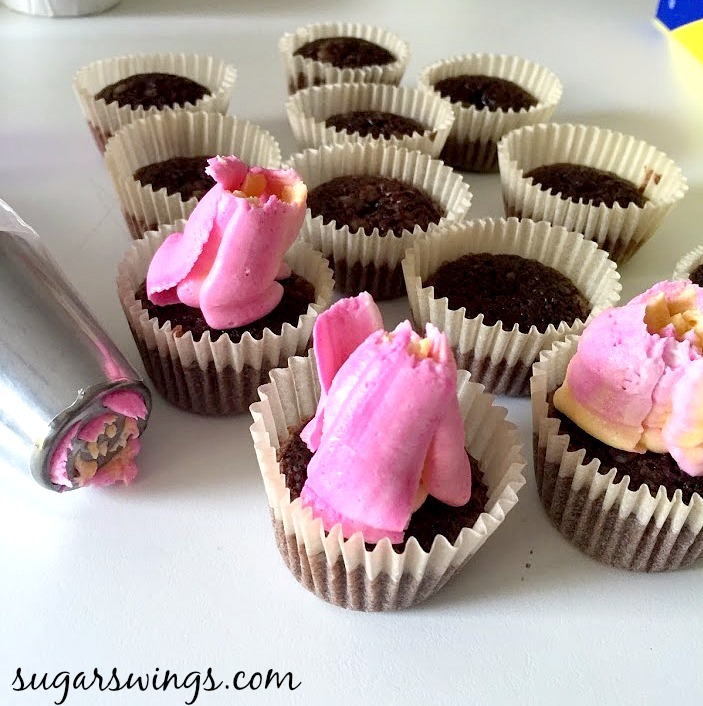 They are easy to make so you can add them to any cupcakes or brownies to bring to parties. The reaction is always so great because they look like they are hard to make or that you need some major piping expertise. In reality they are really very simple with these tips. Save any leftover icing you have from other projects to make these flowers. Single color flowers are pretty, but the subtle multi color flowers are my favs so far. I got my tips on Amazon but they are available a lot of places now too. If you want to see a video of this technique check out Lindsay Ann Bakes! She's awesome and shows you the step by step how to! thanks for sharing too! I love the look of these and the tips make it so easy!